This is a hand made item. If Any sizes are NOT in stock, Shipping will be in 6-8 weeks from the date of your order. Not the 7-10 days. 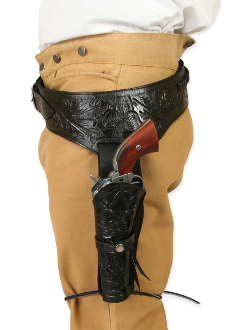 This Black Tooled Leather 38 Caliber Single Gun Holster holds any 38 hand gun and fits 6 or 8 inch barrels with floral hand tooled leather and back waist bullet holes for a cowboy action shooting western event.